Waterfront properties for some are highly desirable either for the ability to use a boat or some sort of other water recreation vehicle or for the great views. Waterfront views can add significantly to the price tag of a luxury home with a great view of a lake, river or ocean. While waterfront properties may offer excellent views and offer more value there are still some things to be aware of when considering the purchase of a waterfront home as this article explores. If you are building a new home with waterfront access the build method may be different when it comes to the foundation. Depending on the condition of the sub-surface where the house will ultimately rest upon different kinds of supports may be needed to ensure the house is stable after being built. Also depending on whether the water levels can come up to or beyond the house the house may need to be raised in order to limit its exposure to the water. In order to make sure the house is setup properly from the start homebuyers should make sure their builders are using qualified engineers to analyze the ground below where the house will be built in order to make sure the right type of foundation support is used. If you are considering an existing waterfront home then in addition to having a regular home inspection it would be wise to have a structural engineer look over the home to make sure the foundation is strong and secure so that your investment does not go floating off into the water or get damaged due to a shifting foundation. Depending on when the home was built and whether there are any plans still available that show how the house was built, the structural engineer should review those plans as well to determine if what was proper at the time still holds for today’s construction standards. Construction standards change over time and what may have been thought a great way in the past to keep the foundation of a waterfront home secure may now be seen as outdated and not necessarily the best for today’s standards. The house with outdated construction standards may not be worth as much as it seems and possibly may need some correction to ensure it stays standing long term. 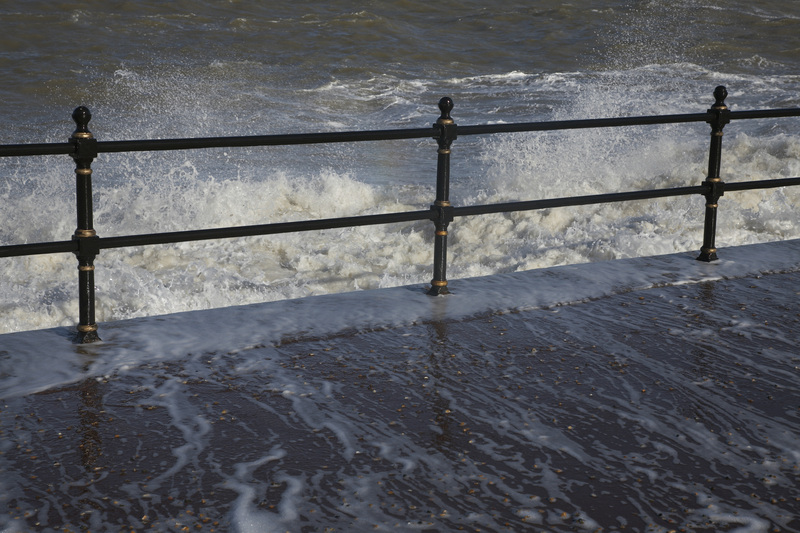 Does The Home Need Flood Insurance? Even if a home does not have water frontage it still made need flood insurance depending on its location. The Federal Emergency Management Agency (FEMA) maintains a website that shows flood zones and is a place where homebuyers can determine if the home they plan on buying requires flood insurance. For homes in a flood plain (an area subject to flooding due to the land being low lying) flood insurance is a requirement when a mortgage is involved. Mortgage lenders will not lend to homebuyers who plan on buying in a flood plain without flood insurance. Mortgage lenders want protection for the money they lend to purchase a home and since the federal government has stated a particular home is in a flood plain the insurance must be obtained along with regular homeowners insurance. Flood insurance is also only available through the National Flood Insurance Program which is a federal government run program. If you plan on buying a home in a flood zone with cash or some other non-traditional means of financing (home equity loan, personal line of credit) by not getting flood insurance the homebuyer bears the risk if flooding does damage the property. Many waterfront properties, especially those along riverfronts (like certain Cincinnati, Ohio riverfront properties or oceans are also in flood zones due to the nature of the way those bodies of waters go up and down on a regular basis. Buying a waterfront home is a lifelong dream for some. Make sure you buy a home with a solid foundation and get the flood insurance if needed otherwise that dream can quickly turn into a nightmare. 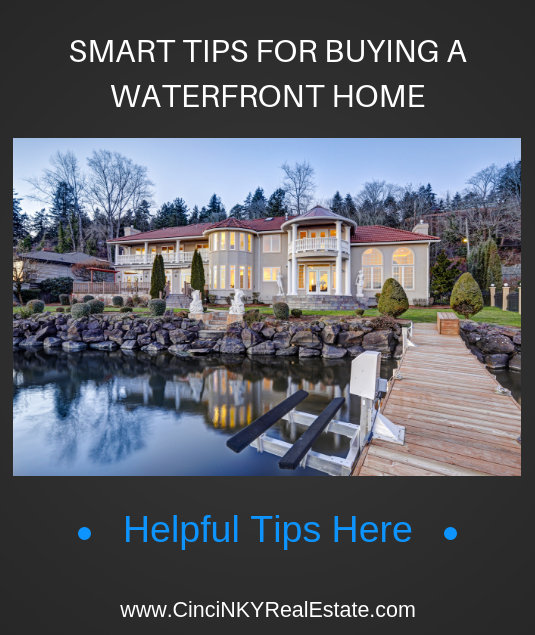 About the author: The above article “Smart Tips For Buying A Waterfront Home” was provided by Luxury Real Estate Specialist Paul Sian. Paul can be reached at paul@CinciNKYRealEstate.com or by phone at 513-560-8002. If you’re thinking of selling or buying your investment or commercial business property I would love to share my marketing knowledge and expertise to help you. Contact me today! I also like the idea of having a waterfront home but I just can't afford it yet. Thanks for sharing these valuable tips Paul. You have a great weekend! Thanks for the comment Tom! Waterfront properties are nice.